Kirsten teaches a general nutrition course (HN 196), Nutrition through the Lifecycle (HN 311), with focus on pre-conception, pregnancy and breastfeeding nutrition, and a graduate level sports nutrition and health counseling course. Since fall of 2015, Kirsten has overseen the independent study projects of approximately 25 nutrition students who have provided group and individual sports nutrition education to UIC athletes. Kirsten has been a registered dietitian since 1998 with a background that includes five years of clinical experience at Mercy Hospital and Medical Center in Chicago and seven years of private practice nutritional counseling work, in addition to numerous nutrition education experiences. Kirsten frequently contributed to e-mail newsletter and magazine articles, had regular appearances in 2004-2005 on NBC Chicago’s morning news fitness segment and co-authored a book entitled “Lean Mom, Fit Family.” published by Rodale Press, 2005. 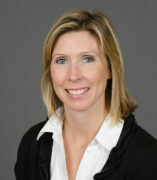 Kirsten has served as the chair of the Wellness Council for District 97 in Oak Park, IL since 2010. She has two children, ages 13 and 17. Kirsten has served as the chair of the Wellness Council for District 97 in Oak Park, IL since 2010. She is a member of the Executive Committee and Healthy Foods for Families Workgroup for Oak Park's Pioneering Healthy Communities initiative, Wild about Wellness—a community-based policy change initiative with a grant from The Robert Wood Johnson Foundation, aimed at preventing childhood obesity .